Welcome to The Neuropsychotherapist. I hope you find our first issue engaging and helpful as we canvass various disciplines within the world of mental health. Today we stand at the threshold of a new era in psychotherapy, where groundbreaking discoveries in neuroscience paint an exciting new picture of the brain and its previously little-understood potential for transformation. I invite you to join us on the journey as we learn more of our remarkable nature as human beings. – Ed. Major advances in neurobiological research during the last decade have changed the traditional landscape of mental health. Dr Rossouw looks at the paradigm shift. 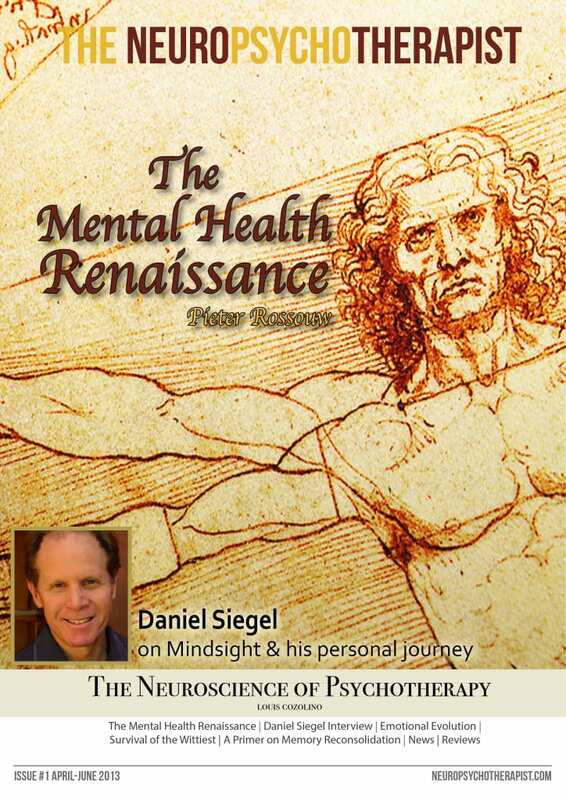 Dr Dave interviews Dr Daniel Siegel about his concept of mindsight, as they talk through a biographical insight into the world of Interpersonal Neurobiology. Why are we so emotional? Professor Turner walks us through the evolution of emotion from an evolutionary sociological perspective of our psychology and socio-cultural pathologies. Therapists and clients alike use humor that intuitively guides some portions of the therapeutic relationship and interventions. Terry Marks-Tarlow looks at what humour is, and the importance of humour in the therapeutic setting. Lou Cozolino explains why neuroscience should be important to the psychotherapist, and that as therapists we can be confident that neuroscience research is substantiating the effectiveness of talking therapies. A Primer on Memory Reconsolidation and its psychotherapeutic use as a core process of profound change, is an introduction to the process of reconsolidation and the profound impact it can have in therapy. Bruce Ecker, Robin Ticic and Laurel Hulley explain the science behind utilising memory reconsolidation in the psychotherapeutic setting.